Crows and ravens have been popular in myth and literature for centuries–Odin’s Huginn (Thought) and Muninn (Memory or Mind) to Poe’s “Raven”–often with menacing depictions. 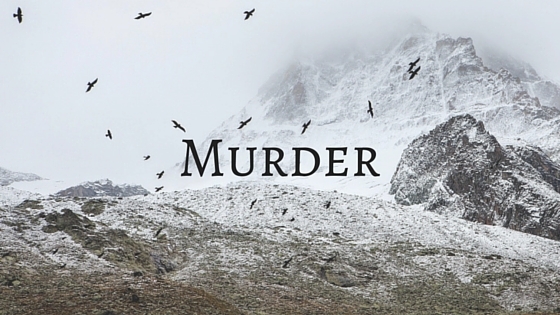 Perhaps it’s because ‘murder’ has been the collective noun for a group of crows since the Middle Ages. But I like crows! 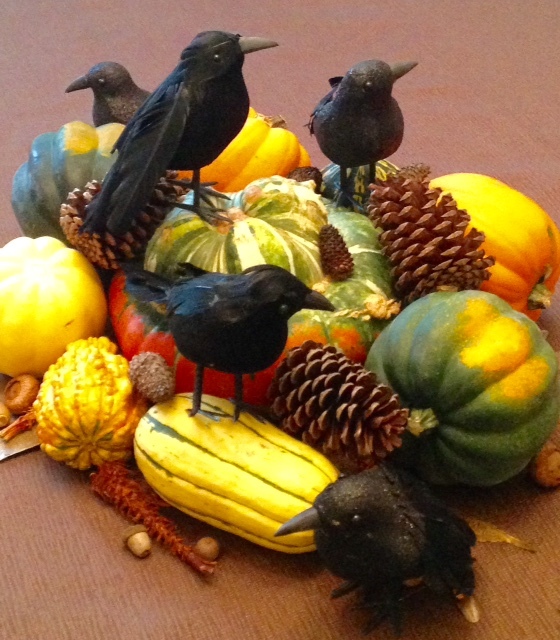 Every year they star in my autumn table. Indeed, I like the entire corvid family of birds—crows, ravens, jackdaws, and rooks. 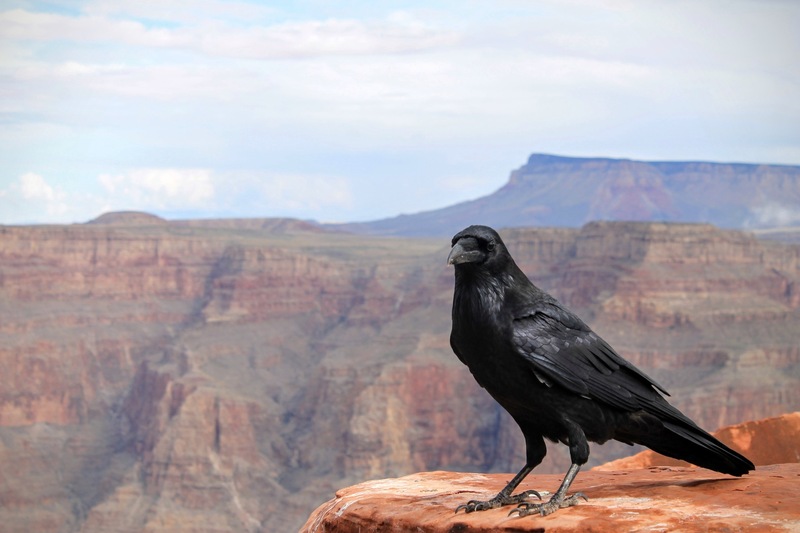 I once took a two-week float and paddle trip through the Grand Canyon, and every campsite came equipped with a pair of ravens. Our guides warned us about their tricks. Even so, we were taken unaware when a raven landed a few feet away and started performing—hopping about, dragging first one wing and then the other in a beautiful raven dance. In the meantime, its partner was unzipping fanny packs and making off with bits of food and anything shiny! 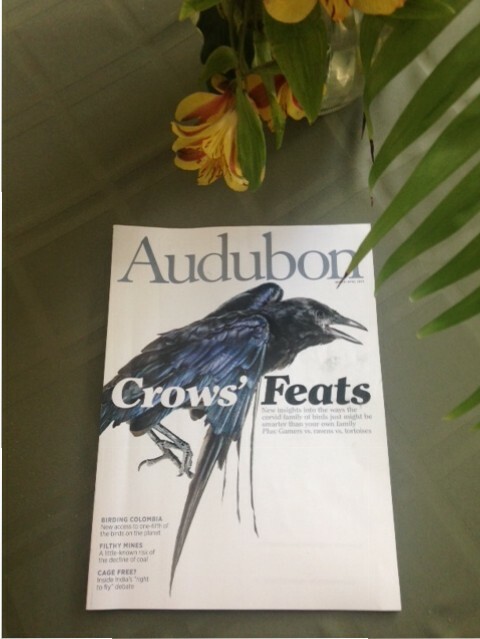 The only one that seems to hang out near where I live is the American Crow, featured in the March-April, 2016 issue of Audubon, along with articles about Common Ravens and a corvid cousin the Eurasian Jay. The articles provide fascinating glimpses of these bird brainiacs and the research that delineates their amazing abilities. Corvids are among the smartest animals on earth. They can make and use tools, play tricks, teach each other new things, and hold “funerals” for their dead. With only one exposure, they can form memories of human faces to be trusted and faces to be feared. Not only do these memories last for years, the fear response is taught to others born after the original exposure, and long after the exposed birds have died. Birds are in the reptilian line of the animal kingdom (who knew?) but relative to their body size, corvid brains are comparable to primates. They appear to have cognitive abilities comparable to a four- or five-year-old child. They’ve been observed putting hard nuts in the street to be run over by cars and then collecting the cracked nutmeats after. They cache food, hide their caches, and steal from each other. 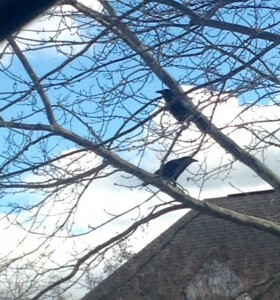 A murder of crows may not sound as appealing as an exaltation of larks, but I find them more interesting! Why use tired images of crows in a cornfield or birds on a wire? When a mention of birds fits your story, infuse your writing with much more interesting bird behaviors! 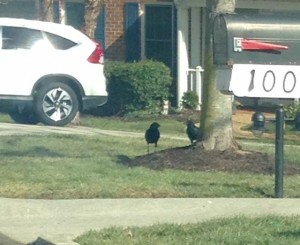 So, given how smart crows are, how long will it be before these learn that I only want to take pictures? I’m waiting for the day they let me come close! Fascinating! Next time I #amwriting I’ll pay more attention to incorporating tidbits like these. 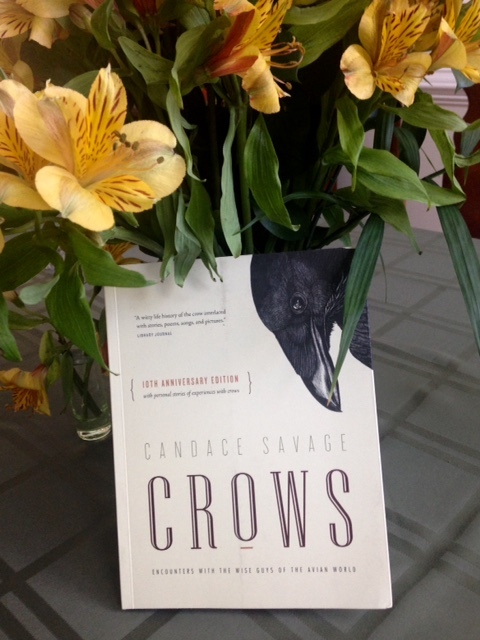 It’s surprising background like the intelligence of #crows that adds flavor and depth to a #murder #mystery ! Yeah. We might want to reconsider using “bird brain” as an insult!